Can Trump be blamed for the Purge? That's what the first poster teases for The Purge 4, which is in theaters this summer. Today, we get the first title, previously rumored to be The Island, along with the first one-sheet teaser poster and the official synopsis. This could end up being the most fun we've ever at at an annual Purge event! The Purge 4 is officially titled The First Purge. And as you can probably guess, it will definitely be taking us back to that first fateful night when maniacs were allowed to roam the streets of America, exacting their revenge under a law-free society for one 12 hour period. Here is the official synopsis delivered by Universal. "Behind every tradition lies a revolution. Next Independence Day, witness the rise of our country's 12 hours of annual lawlessness. 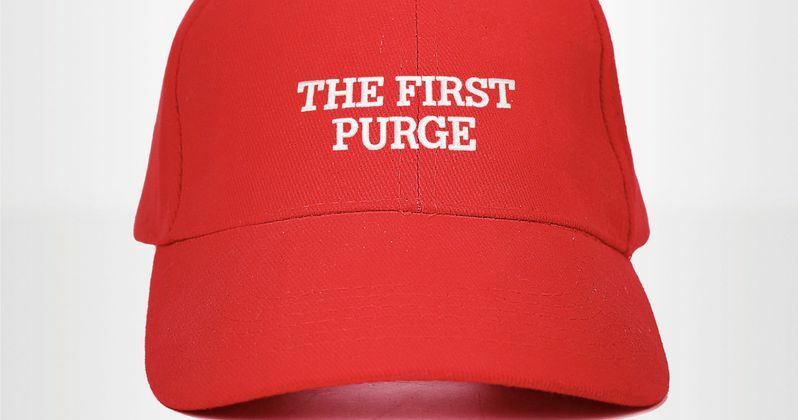 Welcome to the movement that began as a simple experiment: The First Purge. To push the crime rate below one percent for the rest of the year, the New Founding Fathers of America (NFFA) test a sociological theory that vents aggression for one night in one isolated community. But when the violence of oppressors meets the rage of the marginalized, the contagion will explode from the trial-city borders and spread across the nation." Coming off the most successful film in the series, The Purge: Election Year, creator James DeMonaco (writer/director of The Purge, The Purge: Anarchy and The Purge: Election Year) returns alongside the producers of this worldwide phenomenon. Blumhouse Productions' Jason Blum (Insidious series, Get Out, Split), Platinum Dunes partners Michael Bay, Brad Fuller and Andrew Form (Teenage Mutant Ninja Turtles and Ouija series, The Texas Chainsaw Massacre), and DeMonaco's longtime production partner, Sébastien K. Lemercier (Assault on Precinct 13, Four Lovers). The First Purge is directed by Gerard McMurray (Burning Sands), working from a screenplay once again written by DeMonaco. The ensemble cast includes Y'Lan Noel, Lex Scott Davis, Joivan Wade, Luna Lauren Velez and Marisa Tomei making her Purge debut. The Purge franchise has become one of the most profitable movie series' to date, capitalizing on micro-budget productions that reap big rewards. 2014's The Purge took in $64.4 million domestic and $89.3 million worldwide, from just a $3 million budget, while the 2015 follow-up took in $71.9 million domestically and $111.9 million worldwide from a $9 million budget. Last year's The Purge: Election Year took in $79.2 million domestically and $118.5 million worldwide from a $10 million budget. Y'lan Noel is best known for playing Daniel King in Insecure, with this movie marking his first major studio project. and Lex Scott Davis got her big break by playing recording artist Toni Braxton in the 2016 TV movie biopic Toni Braxton: Unbreak My Heart, which she followed up with by playing Alyse Craig on CBS' Training Day.